Make the ship yours while everyone else is experiencing the port of call. Here are 5 reasons why you should stay on the cruise ship in port. For some people who cruise the ports are not so important, one of the main reasons is they’ve already experienced the destination before on a regular holiday or a previous cruise. If you would rather have the ship to yourself then staying onboard while all the passengers are ashore might take your fancy. 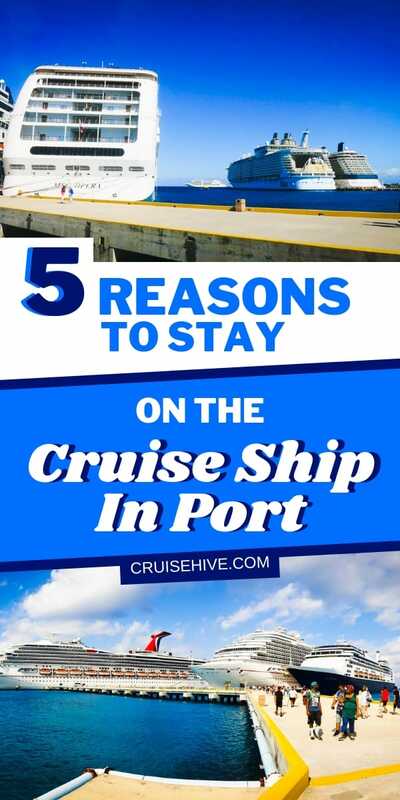 There are many benefits when staying on the ship while in port, and we’ll be giving five reasons why this is. When a cruise ship arrives in port, most guests will go ashore. At times there can be long lines as passengers head towards the ship’s gangway to go on a booked tour or just experience the destination. If there are lines here’s how to deal with them! This means back on the ship there will be no lines for restaurant buffets when getting lunch and no lines when dealing with something at the guest services desk. It’s a nice way to take advantage of something which you would usually have to wait for on a day at sea. Usually, when the ship is at sea, the open deck is bustling with all kinds of cruisers. It can be extremely difficult to find a free lounger unless you wake up very early! Some passengers will even try putting their towel on a lounger so nobody else will take it, but many cruise lines have stopped this. So when in port it is loungers galore, you’ll be able to pick any place and not be bothered by anyone else whether it’s in the shade or the sun. Elevators can be a real pain on a busy ship at sea, once most of the guests are ashore experiencing the port the elevators will be mainly empty. Guests who decide to stay on the ship won’t be met with full elevators and long waits, so getting to a deck is fast and efficient. Don’t worry about the crew using up all the elevators as they have their own in the “Crew Only” areas and there are enough for a relaxing day onboard anyway. So why do you think some people stay on the ship during a port of call? The main reason is that they have been there before. You’ll find that some passengers are avid cruisers and sometimes just like to take advantage of the quiet ship while at the port. Some destinations never change, and with ships getting more innovative they can become a destination itself. One thing which we hate on sea days is a swimming pool full of people, at times it’s difficult to take a swim or even relax due to the number of people in the pool. Many cruise ships these days offer alternative pools, but not everyone will have access to it. When in port it’s the perfect opportunity to have the pool to yourself. You can swim, play and laze about before all the other passengers get back onboard. The main pool is one of the center focus areas of the ship where staff hosts activities and events so it can be very rare to enjoy it by yourself. In port is the perfect opportunity to do many things without other passengers getting in the way. With so many people on ships, this can be a common problem. For experienced cruisers this might be a good idea but nor new cruisers we would recommend on heading ashore, so you don’t miss out of the port of call experience.